Located in Victoria, British Columbia, Canada. Café Bliss is a living, raw food restaurant which is not just a vegan or vegetarian cafe it is a celebration of pure food culture. We serve life enhancing juices, vibrantly delicious superfood smoothies, vital energy elixirs, delicate, cutting edge, wonderful desserts and fresh intuitive daily lunch specials. 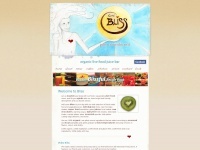 A profile of Cafebliss.ca was found on the social network Facebook. The web server used by Cafebliss.ca is located near the city of Brea, USA and is run by New Dream Network, LLC. This web server runs a few other websites, mostly in the english language. The websites of Cafebliss.ca are served by a Apache server. The markup language of the website is XHTML 1.0 Strict. The visitor analysis software Google Analytics is used to analyze the visitors of the websites. The website does not specify details about the inclusion of its content in search engines. For this reason the content will be included by search engines.